A version of this article appeared in the Webb Society’s Deep Sky Observer during 1998. After hearing numerous tales of how good the skies “Down Under” are, and how all the best examples of all classes of deep sky object lie in the Southern Hemisphere, and therefore totally invisible to those of us marooned at 50º North, I was just itching to see all these lovely goodies for myself so, after begging a £1000 loan from the bank, I booked a flight to Darwin for 15th July 1997. Before setting off, I got in touch with Jenni Kay and Jim Barclay, both Webb Society members well known for their Southern Sky observations, and made plans to meet them at different points in my journey around the eastern half of Australia. Armed with a 3.5” Maksutov-Cassegrain, 10×50 binoculars, a planisphere for 35° South, my Cambridge Star Atlas 2000.0 and the Webb Society’s Deep Sky Handbook Volume 7: The Southern Sky, I flew from Heathrow aboard a Royal Brunei Airlines Boeing 767 on July 15th , and arrived in Darwin, via Dubai and Bandar Seri Begawan, 30 hours later. While on the plane, I noticed a couple of things: firstly, how, as we headed south east, the teapot of Sagittarius tipped up more, and secondly, how vivid the Milky Way was from 37,000 feet up, despite seeing it through thick glass. Darwin wasn’t ideal for observing, so I left there as soon as possible, and headed to South Australia, via Alice Springs and Ayers Rock (Uluru), to see Jenni Kay. For reasons of cost I decided to travel by coach, and at a roadhouse (filling station/shop, similar to our motorway service stations in the UK) not far from Tennant Creek, I had my first quick look at the southern skies. Here was culture shock number one: the constellations were upside down. Obviously it wasn’t a big surprise as I knew they would be like this, but it still took a bit of getting used to. Once in Alice Springs, I contacted the local astronomy society, who weren’t very helpful beyond putting me in touch with a local astronomer called Andrew (whose last name I never did get), who runs an observing session in conjunction with a touristy ‘taste of the outback’ type event, held at a site a few kilometres outside the town. This includes a “barbie”, plenty of beer and Australian republican songs – which didn’t bother me in the slightest, despite their apologies on hearing my southern English accent – and normally costs A$37, but I got in free, as Andrew’s guest. At this time, there was a waning gibbous moon, and the lights were turned off not long before the moon rose. I went outside, and what a sight greeted my eyes – the Milky Way stretched across the sky in a luminous band from Cygnus in the north to Carina in the south, dotted here and there with nebulous patches. 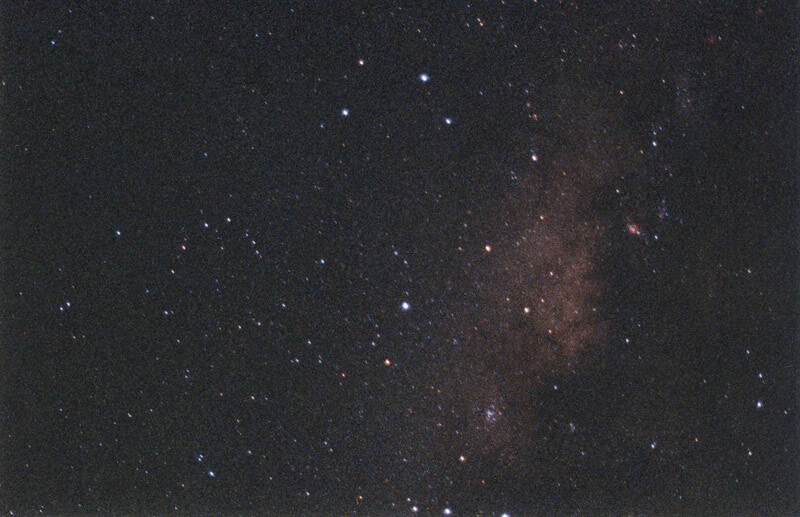 Sagittarius and Scorpius were seen in all their glory high overhead – not on, and partly below, the horizon, obscured by murk, as is the case in the UK. As I looked along the Milky Way I came to a fat, fuzzy ‘star’ shining at magnitude 4. When I looked at it with my binoculars, it showed itself to be a globular cluster – NGC 5139, the famous Omega Centauri. Through the site’s C11 it was an awesome sight – a ball of literally millions of stars. The stars were evenly distributed, except for a curious footprint pattern near the centre, where there were less stars, or obscuring dust. With so much to see, and so little time, I stuck to the ‘lollipops’ for the hour or two I was there. 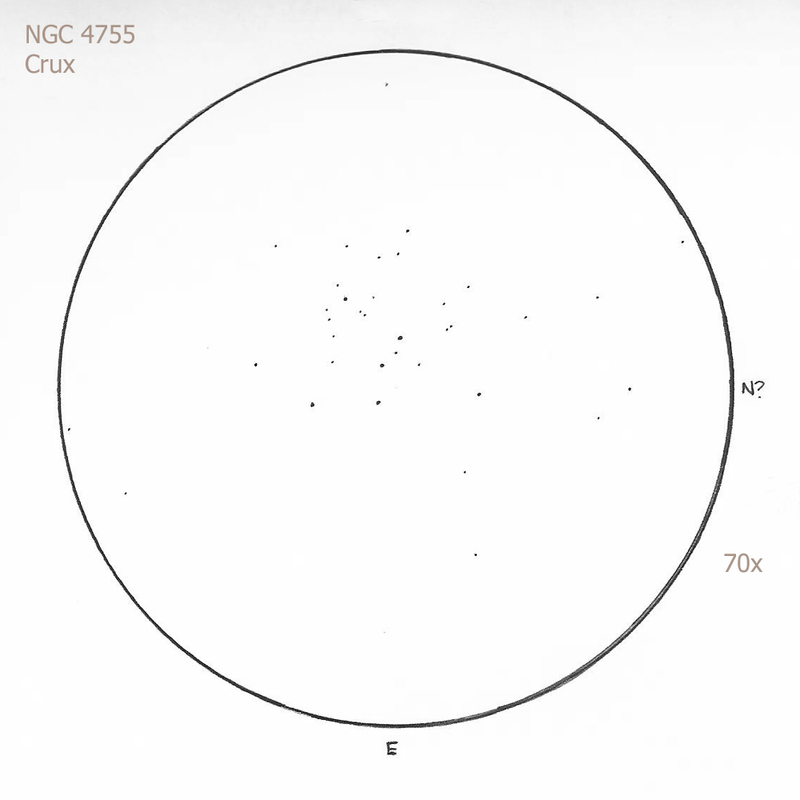 After Omega Centauri, I went to NGC 4755 – the Jewel Box – in Crux. This is one of the most beautiful open clusters in the sky. It forms an ‘A’ shape of blue-white stars with a prominent red star in the centre. Unfortunately, by this time the moon had risen, washing out a lot of the fainter stars. However, the effect did not seem as bad here as it does in the UK, due probably to a drier atmosphere. The next day, I headed for Yulara, the resort for Ayers Rock, and in the afternoon watched the Rock turn dark red as the sun set, but it didn’t change colours as the brochures all said it would. However, the rock wasn’t the biggest source of amusement, that was watching the posher end of the tourist market all sipping champagne as they watched the sun set. They even had posh champagne glasses and not plastic cups. That night, at Yulara, I took the little 3.5” up a small hill at the back of the resort and spent a couple of hours before moonrise looking at the various nebulous patches scattered along the Milky Way. I showed a couple of curious tourists some objects through the scope, and I think they went away suitably impressed. One of the things Yulara advertises is its night skies, but the lighting there is terrible – the concept of cut off lighting did not seem to have reached the Northern Territory – all the roadhouses and townships are just as bad. The next morning, I had a little lie in and didn’t get up until 0830, as I didn’t intend to climb the Rock as it is disrespectful to the Aborigines, although my concern was more my aversion to early rising; you had to be up before 0500 to drive to the rock and then climb it. No thanks. Added to that, climbing Uluru is dangerous and the reports of people getting killed on the climb also put me right off, especially as I don’t like heights anyway. Later that morning, I continued on to Adelaide, via the Olgas, Erldunda and Coober Pedy, and reached there at 10.30 the following day. I was met by Jenni at the coach station in Adelaide, and we drove to her home in the Adelaide Hills. Here is lovely countryside, slightly reminiscent of the rolling hills of southern England, and nice dark skies at night. As it was winter, the weather in South Australia was not ideal for observing, as it was cloudy for about four of the seven nights I was there. However, when it was clear, the skies were lovely, and the naked eye limiting magnitude was greater than 6.0, seeing A1. 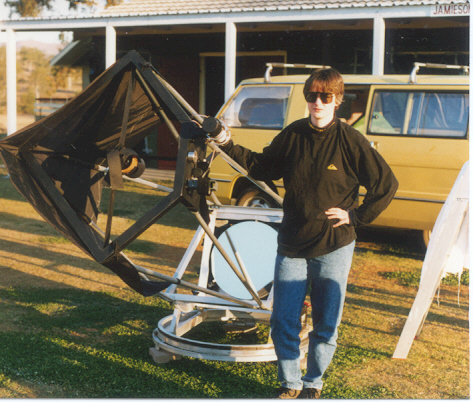 The first night, I used Jenni’s 8 inch Dynamax SCT, while she observed with her 12.5 inch Starsplitter Dobsonian. I also had a look through this, at the Eta Carina Nebula, Omega Centauri and other goodies, and it is a fantastic instrument. I started to observe open clusters in Ara with the Dynamax, but had to give up after an hour or so because of extreme cold. It took me three hours to warm up again. This was the second culture shock – it was COLD here! I knew that it wasn’t going to be subtropical, being in the south of Australia, but I wasn’t prepared for subzero temperatures here either. The next night, I was more prepared and wore about seven layers. I guess it was the usual European and North American error of assuming Australia is always warm and dry; it isn’t because, depending on where you go, it can get colder and wetter than the UK when it likes and, in fact, parts of it are cloudier and wetter than parts of England (Sydney gets more than the average annual rainfall of SE England and their summers can be as crap as ours); on my May 2009 visit I ran into loads of cold Europeans and Americans in Victoria and NSW wearing summer clothes. Having made that mistake in 1997, my fleece and thick jeans kept me warm while I saw other visitors shivering in shorts and t-shirts. NGC 104 in Tucana. Also known as 47 Tucanae this is the second best globular cluster after Omega, but is very different. It has a very dense core and is more symmetrical than Omega. Its outer stars are easily resolved at 43x; at 150x the core has a granular appearance, and there is a dark area in the north west part of the globular – either an area poor in stars, or obscuring dust. There are chains of stars radiating out from the centre in all directions. At 300x, the cluster completely fills the field of view. NGC 2070, the Tarantula Nebula in the Large Magellanic Cloud, yet another fantastic southern object. This is relatively large and bright, despite being located in an external galaxy, and has large faint filaments stretching south west and north east. Many wisps and tendrils seen. There are also faint patches to the west and east of 2070, one of which is NGC2044. NGC 5128: This is Centaurus A, a peculiar galaxy. It is roundish, with a prominent dark lane bisecting it, roughly north west to south east. The southern half is brighter than the northern half. NGC7293: The Helix Nebula in Aquarius. This planetary is enormous with a low surface brightness, and is ill defined against the background sky. Looks like a ring with diffuse outer edges. No central star seen. No filter used. I also had the most fantastic views of Jupiter I have ever had – many bands and festoons were seen. This was due to the superb, steady seeing. During my visit to South Australia, Jenni, Bruce and I drove to the ASSA’s observatory at Stockport, around 80km from Adelaide. Two large domes dominate the site, one housing a 20 inch Newtonian Cassegrain and the other, which once held a 30 inch, now used for storage. The site also has a 14 inch Dobsonian which is known as the Coffin, due to its’ rectangular shape. As well as the domes there is a clubhouse which is well furnished, including a kitchen and a shower. Soon, however, it was time to leave South Australia and continue by coach to meet Jim Barclay in Queensland. After a 33 hour coach journey (never again – it may be cheap but is very uncomfortable. Having said ‘never again’ at the time, I went and did exactly the same thing 12 years later, spending 5 days travelling between Melbourne and Cairns, but now ‘never again’ means exactly that) through South Australia, New South Wales and into Queensland, I arrived at Toowoomba coach station, where I was met by Jim Barclay, the Webb Southern Sky secretary. We drove to Jim’s observing site at Ellesmere, about an hour or so’s drive from Toowoomba, and about 200km from Brisbane. It is in a pretty remote location, and at dusk, kangaroos come out and feed around the observatories, and on the way there, I also saw an echidna (a hedgehog-like monotreme) crossing the road. Here, Jim has a large dome, currently housing a 12.5 inch Dall-Kirkham Cassegrain and CCD equipment, as well as a smaller run off shed which contains a Vixen LX200 and various lenses. Despite having been awake for about forty hours, I decided to observe. With fantastically dark skies with a limiting magnitude of 7.0, – the globular cluster M4 was visible to the naked eye – and excellent seeing, this was not to be wasted. During the seven nights I was there it was only cloudy about once, so there was plenty of time to observe. I decided to have a go at astrophotography while I was there, nothing elaborate, just point the camera at the sky and open the shutter. I got some spectacular star trails around the South Pole, on 100 ISO slide film, but 30 second shots of the Milky Way on Konica 3200 print film were met with mixed results. On one hand I was pleased with them, they are not bad for a first attempt, but the focusing leaves a bit to be desired, so I’ll stick to the visual stuff for now, I think. NGC 6752 in Pavo, which is large, bright, easily resolved at 120x and has a bright dense core. NGC 6723 in Sagittarius, which is theoretically visible from the UK, but is too low to be seen well. It is a bright and fairly large globular which shows uniform brightness and is very condensed with a granular appearance. NGC 6388 in Scorpius: This globular is very bright and large and highly concentrated. It has a very bright, dense core and looks somewhat like a smaller version of 47 Tucanae. NGC 5189 in Musca: This is the only planetary I observed from Ellesmere, and it is a very interesting one, as it looks like a barred spiral galaxy at first. It is bright and easy to identify in the star field. The main feature is a bright bar running more or less east-west through the middle. An OIII filter brings out more detail, revealing a shell of gas either side of the bar. NGC 253 in Sculptor: This is a spectacular galaxy. It is huge and totally fills the field of view from north to south. It has a bright centre and shows mottling. It can be seen from the UK, but is rather low. Caroline Herschel discovered it from England in 1783. While at Ellesmere, Jim and I decided to have a go at finding the elusive Horsehead Nebula. We had to wait until about 4am, when Orion was sufficiently high enough to be clear of too much atmospheric disturbance. Despite all efforts, Jim with the CCD, and myself with eyeballs and various filters, we saw…nothing (not at all sure why – IC 434 should certainly have been visible. Looking back, I can put it down to inexperience on my part, certainly in those days, although there’s no explanation for the CCD failing to pick it up). We did, however, see NGC 2024, the Flame Nebula, which is located to the north of the Horsehead and easily seen with averted vision. It is large and diffuse, and dark lanes were seen. It was observed at 120x. NGC 6475 (M7) in Scorpius: Just visible from the UK, and the most southerly of the Messier objects. It is very large and rich, and is impressive, even from the Brisbane suburbs. The cluster is dominated by 10 or 11 bright bluish white stars, with fainter, also bluish white, stars in among them. NGC 6250 in Ara: This is a ‘W’ shaped pattern of bright yellowish stars, with fainter stars in the middle. It is not very rich, but more stars would probably show up from a country location with no moonlight. The cluster is easily distinguishable from background stars. Pretty bright. NGC 5460 in Centaurus: This is an attractive, small, not overbright open cluster. It is shaped a bit like a very short snake and is somewhat compressed. There are brighter stars in the tail of the snake, some fainter ones in the middle and some brighter stars in the head. The cluster is easily distinguishable from the background stars and is not very rich. 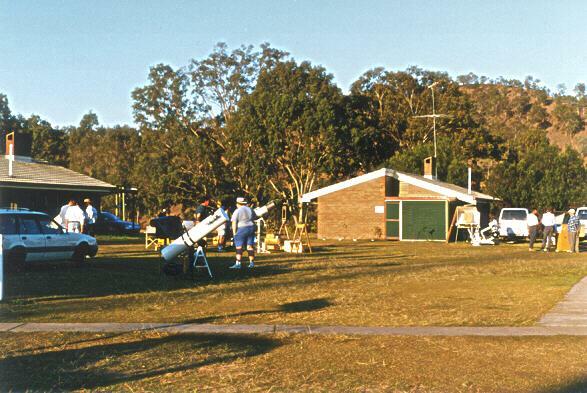 During my time in Brisbane, I went to a meeting of the South East Queensland Astronomical Society, which Jim is a member of. I gave a talk on what I had done in Australia so far, what I had seen, both astronomically and terrestrially, what astronomy was like in the UK, what life was like in the UK compared to Australia, especially the standard of living, which is slightly higher in Australia, and so on. They could not believe how expensive the cost of living in Britain is, compared to Australia, especially the cost of petrol and diesel. Australia has since become more expensive, as I discovered in 2009, but still falls slightly short of the prices we pay in the Old Country. However, for optical gear, prices are now comparable and Australia might even shade it for cost. I also went up to the Sunshine Coast with Lynne Barclay, Jim’s wife, who was excellent company and very good fun indeed. We had a great laugh when we visited Caloundra, Jim and Lynne’s third residence, and I did some surfing while I was there as I was a surfer in those days. A crap one, I admit, as “busting airs” and “hanging ten” attempts usually led to me and the board parting company, but at least I could stand up and go along. I managed to wipe out and cut my knee on some coral, which subsequently became badly infected meaning I had to go to a clinic and get some antibiotics. Fortunately it didn’t cost me much, only $25 for the consultation fee, and I was given some antibiotics from their stocks. It was better than it costing me a leg and even – as it turned out I had blood poisoning – my life; I was told I’d have been dead within 12 hours if I’d left it! Coral makes picturesque reefs but is pretty nasty stuff if you cut yourself on it. The day after the SEQAS meeting I headed up the Queensland coast to Hervey Bay, to do a little whale watching. As luck would have it, a chap who bought a telescope from Jim lived up there, and invited me to stay there for a few days. A couple of days later we, along with a whole herd of tourists, set off on a catamaran ferry to see some whales. We spent a whole day off Fraser Island, and it was well worth the cost as we had the most fabulous views of humpback whales doing the things that, previously, I had only ever seen on David Attenborough programmes. I stayed in Hervey Bay three or four days, and then headed back to Brisbane as I planned to go to the annual Queensland Astrofest, which is a week long star party. It starts on the Monday and finishes the following Sunday, but I could only stay until the Wednesday morning as I had to fly back to London on the Thursday. It is held at a place called Lions Camp Duckadang, near Linville, which is a two hour drive from Brisbane, and has excellent dark skies. As public transport in that area is none too frequent, I managed to obtain a lift from a South East Queensland Astronomical Society member, Dave, who is a friend of Jim’s. We arrived at around midday, and prepared for the night’s observing. Preparations included having to change all the white fluorescent light bulbs in the buildings to red ones, and taping large sheets of black plastic to windows to prevent stray light escaping. When there were no red bulbs left, the white ones were simply removed. I was prepared to observe with my small scope and binoculars, and also to wander around scrounging looks through other people’s scopes – which people were incredibly generous about – but I was in luck. A Webb Society member, Graham Long, had brought with him a 20 inch Dobsonian, belonging to a friend who was overseas, as well as his own 10 inch Dobsonian, and he kindly allowed me to share it during my two nights there. With it we hunted for some obscure and semi-obscure planetary nebulae, as well as other celestial goodies. The skies were very dark, with a limiting magnitude of 6.5 to 7.0, but on the second night, there was a bush fire nearby, which affected the seeing slightly. Here is a selection of objects seen using the 20 inch. All observations were made using an OIII filter, except where stated. SHAPLEY 1 in Norma. This is a nice oval smoke ring with the south west edge brighter. The central star is visible, especially with averted vision, when it really jumps out at you. It has fairly diffuse edges. 200x. HENIZE 2-141 in Norma. This p.n. is very small and bright. It is brighter on the west side and is slightly elongated north-south, forming an oval shape. The eastern side is much fainter. No central star visible. 350x. HENIZE 2-207 in Ara. This p.n. is very interesting, as it is bipolar and has an unusual shape. It looks twisted, and is elongated north-south. Both parts are of even brightness, and each is oval shaped. The edges of each are well defined. The p.n. is situated in a rich star field. 200x. 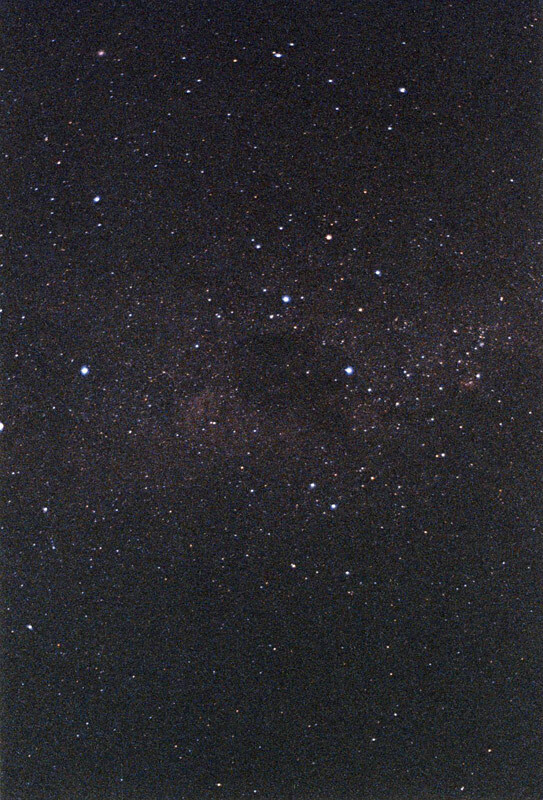 LONGMORE 16 in Scorpius. This p.n. is very large (83”) and very faint – it needed the O3 filter to be seen properly. It is round with diffuse edges and seems to be brighter across the centre. The eastern half is brighter than the western half. No central star seen. Best seen using averted vision. 156x. NGC 6818 in Sagittarius. This planetary is also known as the “Little Gem”. It is small, very bright, and has an intense blue colour. There is a suggestion of darkening in the centre, when p.n. is looked at with averted vision. With direct vision, there is a circular disc with fairly even brightness. The edges are fuzzy, not sharp. 156x. PK 322-2.1 (MENZEL 1) in Norma. This is a pretty large planetary nebula (50”) which is rather faint. It shows some darkening towards the centre, but there is no sign of a central star. The edges are fuzzy, and averted vision shows that there may be a hint of lobes to the north and south, but I cannot be sure about this. 156x. NGC 6302 in Scorpius. Also known as the Bug Nebula, due to its’ resemblance to an insect in photographs, supposedly looking like a bug that has been squashed. It is very bright and has a compact stellar looking centre, with extensions to the east and west. It has diffuse edges, and the western extension shows some mottling. The p.n. is a nice blue colour. 156x. NGC 6822 in Sagittarius. This is a galaxy, and is visible as a faint elliptical glow barely discernible against the background sky. It is elongated roughly 2:1 north to south and is of even brightness with no central condensation. Even in the 20 inch it was very faint – it may be invisible in smaller apertures. If anyone has seen it in a smaller scope, I would be interested to know. It is located in a fairly rich star field. x60. No filter used. I also had a look at the Eta Carina Nebula through the 20 inch, with a 2 inch eyepiece, and an OIII filter. WOW!! What a superb view. The central region presented the effect of thick grey smoke embedded with stars. I didn’t even attempt to sketch it. It was absolutely awesome, and easily one of the most spectacular celestial sights. The effect of the same optical combination on M20 and M17 was just as breathtaking. During the course of the two nights, I did have a wander around the telescope field, talking to other observers and looking through their scopes. Some observers had structured observing programmes, such as Graham with planetary nebulae, while others were more casual. Some sketched, others did conventional photography, others took CCD images, while others just scoped out the heavens. At one point during the first night, another observer pointed out that M31 had just risen. I raised my binoculars, and there it was, in a better view than I usually get from the U.K. despite being very low. This does seem unfair as, not only do southern observers have all their own good stuff which we northerners can’t see, they have a lot of our good stuff as well. Nature certainly pulled an unkind trick here, considering most astronomers, amateur and professional, live north of the Equator. All too soon it was time to head back to Brisbane, to catch my flight back to England. The six weeks I spent in Australia passed far too quickly, but at the same time felt much longer. I have since been back, in 2009, but this was not an observing trip and what little observing I did was done with my binoculars while cloud-dodging. I am going back for my third trip in March-April 2014 and, this time, I’ll be at the OzSky star party at Coonabarabran for a week. My thanks for all their help and hospitality go to: Jenni and Bob Kay, Bruce and Scotty in South Australia; Jim and Lyn Barclay, Graham Long, Dave, and the other members of the South East Queensland Astronomical Society, plus anyone who let me look through their scopes. Many apologies to any that I may have inadvertently missed. References : Webb Society Deep Sky Observer’s Handbook Volume 7: The Southern Sky. Series edited by Kenneth Glyn Jones. Hartung’s Astronomical Objects for Southern Telescopes: Revised and updated by David Malin and David J. Frew. Various articles in previous DSOs, and a series of articles by Jim Barclay in Astronomy Now. 1990. Instruments used during this trip: 10×50 binoculars; 3.5″ Maksutov Cassegrain; 8″ inch Dynamax Schmidt Cassegrain; 10″ Dobsonian; 12.5″ Dobsonian; 8″ Celestron Schmidt Cassegrain; 8″ Classical Cassegrain; 12.5″ Dall Kirkham Cassegrain; 10″ Dobsonian and 20″ Dobsonian. Alice Springs, NT: Site about 10km from the town and very dark with Mv of 6.5 to 7.0. Lobethal, SA: Approximately 35km from Adelaide with a Mv of 6.1 and belongs to Jenni Kay. There is a roll off roof observatory containing an 8″ Dynamax and a 12.5″ Starsplitter Dobsonian. Ellesmere, Qld: A site belonging to Jim Barclay, approximately 200 km from Brisbane and about 20 km from the nearest town. 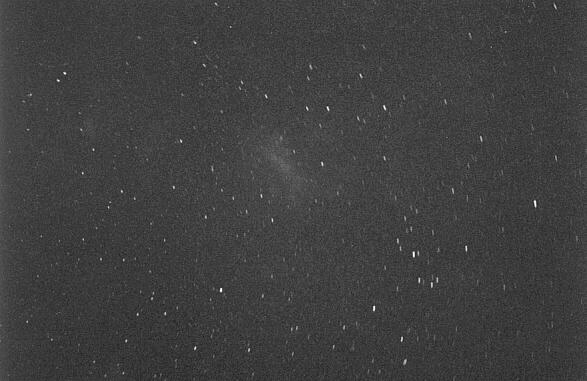 Mv (naked eye) is better than 7.0 – M4 is easily visible to the naked eye. The main observatory houses the 12.5″ Dall Kirkham. Manly, Qld: Also belonging to Jim Barclay this is a suburban site adjacent to the Queensland state capital Brisbane. Not an ideal site as there is significant light pollution – there is a large container terminal nearby – with a naked eye limiting magnitude of around 4.5. There is a small observatory in the garden with an 8″ Vixen Classical cassegrain mounted on a Vixen Great Polaris mount with Sky Sensor digital setting circles. “Lions Camp Duckadang”, Nr Linville, Qld: This site is in the bush, 120 km from Brisbane and is used by the astronomical societies in and around south east Queensland for an annual star party. A very dark site (as to be expected) and is well equipped with a kitchen, dining room, dormitories and shower facilities, so no roughing it – fortunately! It was very cold at night, around -2C and warm during the day, above 21C. The site’s name comes from the fact that it’s owned by the Lions organisation and the Duckadang part is for an Aborigine local who lived there years ago.